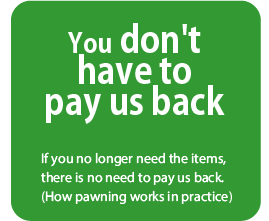 Assessing our customers’ items, and then offering money with the item as security is ”pawning”. This is a highly trustworthy system you can use in complete confidence, which boasts 700 or more years of history according to documentary evidence from the Kamakura period, and which has been passed down the generations to today. Selling your own possessions in return for cash is known as “kaitori” (trade-in). 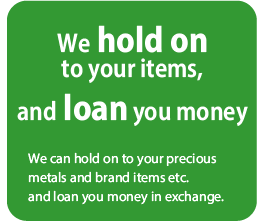 Sell your brand products and jewelry etc., and turn them into cash, or use us to deal with your unneeded possessions when you move house. We also offer trade-ins via home delivery, so you can use our services with ease. Age limit: Anyone 18 years of age or over can use our services. *This excludes high school students. The holding period is three months and can be extended. Once the period has elapsed, ownership rights will be transferred to the store. We will not press for money in any way, such as demands by phone or reminder letters. Pawning is perfect for the following types of people! Those who don’t want to let go of an item with sentimental value. Those who don’t want to take on any debt history. Those who want to avoid issues if their family finds out. Those who don’t want to add to preexisting loans or other debt. 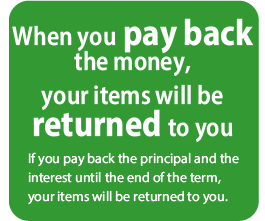 No debt history will be left with any personal credit information facility! Assessment is free, and you can get cash in hand on the spot.